Marietta Square Art Walk celebrates the arts Friday, May 1, and continues every first Friday through November. Art galleries, museums, boutiques and restaurants host local artists and musicians from 5pm – 9pm during this free, self-guided tour. Visitors should also keep an eye out for dancers from the Georgia Metropolitan Dance Theatre performing around Marietta Square. The Beer Garden returns by popular demand, where guests can purchase beer and wine while listening to live music in Atherton Square, located behind Cool Beans Coffee. The students of Jennings Music are returning as a regular feature of the Beer Garden. Both school-age and adult music students enjoy the energy of performing to a live audience, and Marietta Square Art Walk provides an atmosphere where every artist can thrive. Katy Malone, from the Zuckerman Museum of Art, is the guest judge this month for the “Best of Show” award. 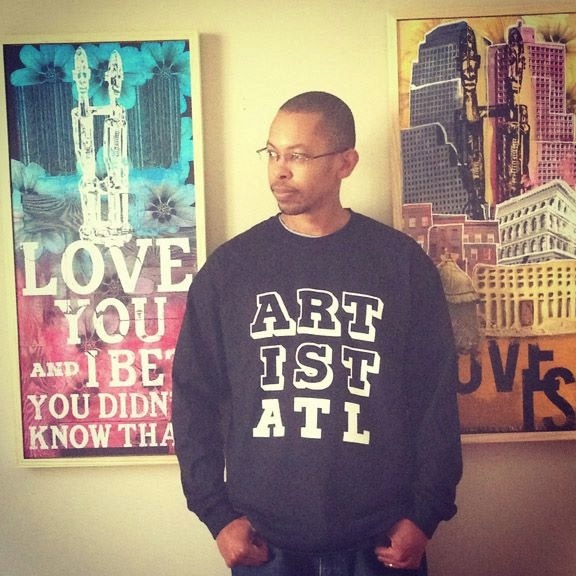 Jamaal Barber (pictured) was the winning artist in April. He will be given the opportunity to display his art in November at one of four local gallery sponsors: dk Gallery, Marietta Square Artist’s Attic, 2 Rules Fine Art and Red Door Art Gallery & Studio. Photographer Sherry Rosen won the “People’s Choice Award” last month, voted for by Art Walk guests online through Facebook. Rain or shine, Marietta Square Art Walk is the place to be for extended evening hours of shopping, dining and an incredible display of local creativity. Marietta Square is an easily accessible, unique urban destination located just 5 minutes from I-75 with an abundance of FREE parking. For metro-Atlanta residents or tourists who want a place to gather and enjoy a unique twist on intown culture, the Marietta Square is the definition of a new South city center. 19th century buildings and sidewalks serve as the backdrop to an intriguing blend of contemporary dining, arts, culture, and entertainment. The beautiful square and walkable streets host a never-ending calendar of events and markets. A mix of cultures have given rise to an array of chef-owned restaurants, and a thriving art and theater community. Those searching for a destination with a blend of intown culture and small town charm – just minutes from Atlanta – will find the Marietta Square a truly authentic experience.